Suislaw National Forest makes patchy appearances from Tillamook to Coos Bay as it stretches lazily down the western coastal range of Oregon. With up to 100 inches of rainfall on a wet year, vegetation is as green as it is moist—soft, waterlogged mosses coat tree trunks and lacey lichens suspend carelessly from branches. In winter, fog hangs densely in low-lying meadows, whispers through evergreen bows, and sweeps a light yet substantial mist across everything in its path. In short, it’s a beautiful place, if also somewhat dark and damp. And for us it's a place we just can't seem to get enough of. People usually have a few questions when they hear we have a little bit of land in the coastal forest and a tiny cabin. 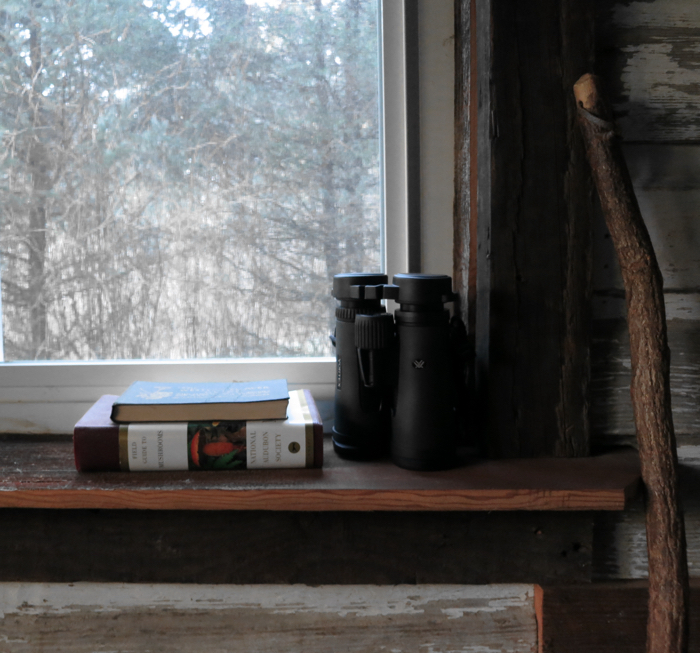 It's hard to describe just how small and rustic the cabin is, or how remote and disconnected the property happens to be, and that those things are what make the entire experience so cool—to us, anyway. Even though there are plenty of off-grid solutions available for modern convenience, we have yet to implement any of them. That means that when we head to the woods we leave behind power, plumbing, natural gas, and an internet connection. But as a pair who's always been smitten with bygone eras, we tend to embrace our primitive setup. Quick backstory: when we bought the five acres in 2014, we were fairly certain that with a lot of elbow grease we'd be able to restore the original 1970's kit cabin that sits on the property back to its glory days. Unfortunately, after some serious DIY demolition and soliciting a few professional opinions, we realized what we were dealing with was an unsalvageable, dilapidated mess full of dry rot and animal droppings (not to mention a poor foundation) that had sat for close to 20 years uninhabited in a rainforest. After a few months back at the drawing board, we decided to start small so that we had someplace out of the rain and cold we could stay while we took on that larger project. So in April of last year we worked with Oregon TimberWerks to construct a 12x12 one room cabin with a sleeping loft at the edge of the meadow against a backdrop of towering spruce and leaning alders. Fast forward through the end of 2016, and we'd managed to paint and stain the exterior portions of the tiny cabin (and outhouse), as well as fully finish out the interior with materials procured from Salem Salvage, including reclaimed flooring, wall cladding, and trim—much of which is old-growth timber collected from derelict barns around the Willamette Valley. When it came time to outfit the small space with furniture, we tried to strike a balance between economy, integrity, and practicality. Most of all, we wanted to keep it as simple and clean as possible, not only because of the lack of room for extra items, but also because we were aiming to have as few material distractions as possible. Every item we've brought out is a deliberate and purposeful decision, and we're continually vetting what's there to see what else we can eliminate. What does an average weekend look like without modern amenities? Our bathroom is an old-fashioned outhouse tucked into the forest. It's set up with a simple sawdust bucket system, and we compost our humanure directly on our land. 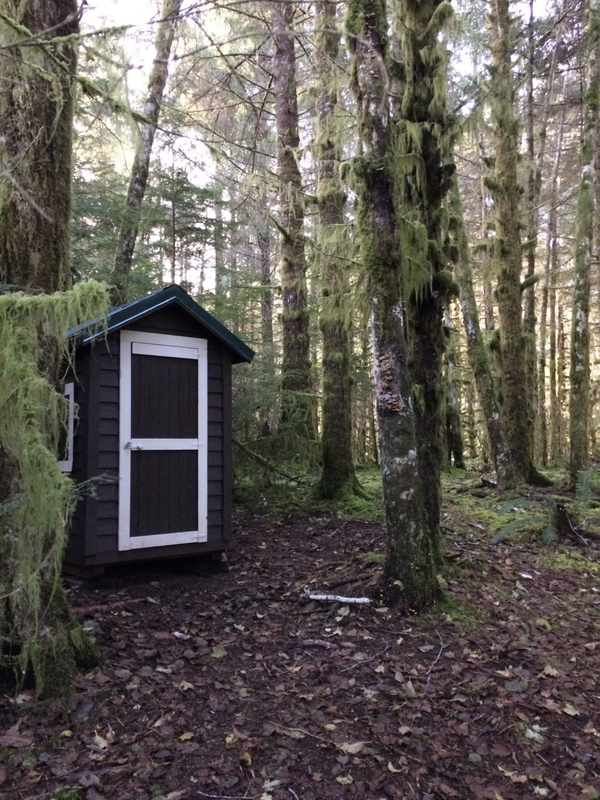 We've been surprised to find that there's virtually no smell with a sawdust toilet, and for an outhouse, it's got a pretty spectacular view. As of yet we don’t have a method for bathing. This works out alright for us, since our stays are generally limited to two- and three-day trips and we're fine going a few days without a shower. That said, we'd love to build a simple wood-fired hot tub in the next year or so. That counts as a bathtub, right? Water for cooking and drinking is hauled in and dispensed using a ceramic water crock, which again, we like in a way because it helps us stay cognizant of our water consumption. Someday, however, we'd love to collect and filter water from our metal roof since there’s no shortage of rainwater available. We're still tweaking our "kitchen" to achieve more functionality. Currently it's a minimal outdoor setup on the porch/deck which we have to construct/deconstruct upon arrival/departure, including two camping tables, a Primus camp stove, a Yeti cooler, and essentials like a good chef’s knife, cast iron skillet, and Chemex coffee maker. We kind of enjoy the break from our normally labor-intensive cooking routine at home, but admittedly it's a pretty clunky arrangement which we often cope with by making super simple meals that don't require much cooking, or on rare occasions hit up a spot on the nearby coast. The system meets our needs, but we're constantly thinking about how to improve it. We heat the cabin 10 or 11 months of the year by building fires in our tiny Jotul woodstove, which puts out a ton of heat. We often get so warm that we have to open the windows to cool down. At night we live mostly by candlelight, which we absolutely love (except for the fire hazards and eye strain). As far as activities go, when its just the two of us (which is how it is 95% of the time) we spend most of our time just reading by the fire, listening to classical music on the radio, tromping through the woods in wonderment, stretching out, doing a little yoga, and catching up on sleep. Now and then Evan will write letters on an old typewriter, or we'll play a game of Scrabble while attempting to spot birds with our binoculars. Honestly, sometimes we just stare outside at the vast green forest-scape in awe and try to fall back in love with the world after feeling beat down from city life and news. In the fall we forage for mushrooms and in the spring we collect berries. Lately we've taken to exploring the beaches (Pacific City and Neskowin are each just a short 20-minute drive down the hill). It's a quiet, easy place to exist and for us a true reminder that we can always do with less than we think.